How many Irish couples can relate with the following scenario? You have watched countless friends and family members get married in local venues; they have had similar traditional weddings probably with 150+guests. You have been on the wedding circuit for so long now that you can nearly predict the menu options, the choice of band, the props and what sweets will be at the candy cart. And for those that tried something new or alternative, well it most likely cost them an arm and a leg. Sound familiar? This was the situation that I found myself in at the end of 2013 when we first got engaged. Based on all of the above, we knew immediately, we needed to break that mould. Unfortunately, once you have made the conscious decision to flee from Ireland for a destination wedding in the sun, those feelings of giddiness and excitement are quickly replaced with worry (will anyone attend) and guilt (will it cost guests a small fortune). We have all been in the same boat. Let me outline my top 10 reasons why you should choose Malta as your wedding destination location and trust me; all of your fears will quickly be put at bay. 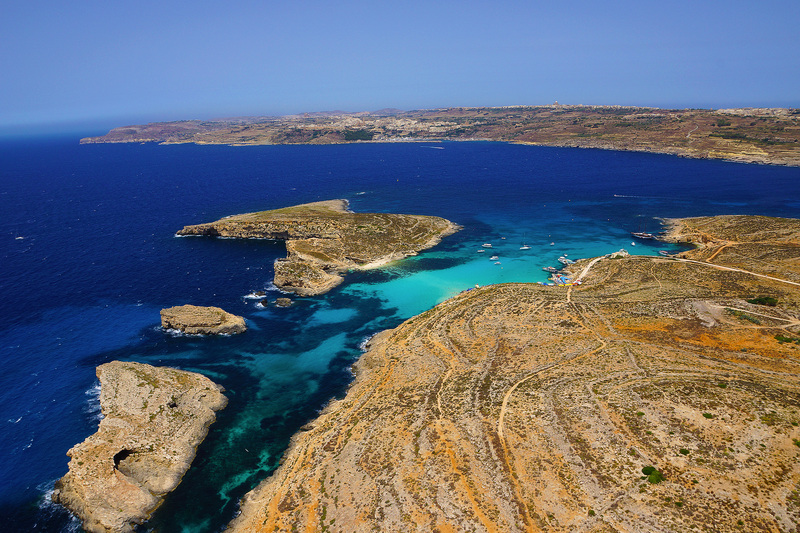 Malta has a typical Mediterranean climate meaning they get hot and dry summers, very mild winters and approximately 3000 hours of sunshine per year. Rain is limited mainly to the winter months so if you are considering a destination wedding, then anytime between April/May to October is ideal. August tends to be the warmest month with daily averages of 28-34°C. A “real-feel” temperature of closer to 40°C is not uncommon in July and August. Irish and UK brides favour the months of May, June, September and October for the warm but bearable temperatures. Direct flights from Dublin to Luqa (pronounced loo-ha) are via Ryanair. Return flights operate for a minimum of 5 days per week in their summer season and 3 days per week off-peak. Flights durations are approximately 4 hours so it is no longer than flying to Lanzarote or Tenerife for the sun. Malta adopted the Euro in 2008 so your wedding party don’t need to worry about sourcing alternative currency. Prices in general for food and drink are much lower than in Ireland so with a little research there is excellent value to be obtained in Malta, particularly if you travel off-peak. You will expect, like everywhere, to pay more in the usual tourist thoroughfares so be mindful of these locations. Like in Ireland, should you decide to have your wedding mid-week or off-peak, there are options to obtain reduced prices from suppliers. A little goes a long way in Malta, so you can easily create a stylish, fun and bespoke wedding to wow your guests. English along with Maltese are the official languages of Malta. As the country has an ever-growing tourism industry (2 million visitors in 2017) and 88% of residents speak English, you will have virtually no issues communicating in Malta. The Maltese are renowned as being a relaxed and friendly nation and their service industry is one of the best in Europe. Almost guaranteeing that your will have an incredible stay. Valletta was declared as the 2018 European Capital of Culture. This beautiful fortified city of mainly baroque architecture will be brimming with exhibitions and events this year. The rich cultural heritage of Valletta will be celebrated greatly in 2018 so this will be an exciting time to marry in Malta. In addition, the people of Malta celebrate a number of religious Feast days annually. “Festas” are created in the small villages and events steeped in folklore are celebrated throughout the island. You will be spoiled for choice with potential wedding venues in Malta. You may choose to have a civil or religious ceremony. Whether you are looking to wed in a stately palazzo, a traditional farmhouse, a romantic villa, an impressive castle, an historical site or a luxury hotel, Malta has an abundance of wedding venues to choose from. The main hub for bars and clubs in Malta is Paceville; in the vicinity of St. Julians. The Maltese islands have become popular with international music acts and there is always an event to suit everyone’s taste. If you travel in the summer month’s keep an eye out for the Isle of MTV Festival which takes place in June each year. Malta is also renowned for its excellent restaurants which can be found throughout the islands. There is an abundance of hotels throughout Malta, so you will be spoiled for choice. If you are travelling for a wedding or honeymoon, you may decide to stay in one of St. Julian’s best 5* hotels. The most popular with tourists are Hilton, Corinthia, Intercontinental, Radisson or Westin. These may be on the pricier end of the scale for your guests so they may need to avail of some 4* options. Highly rated in the St. Julians area are Hotel Juliani, Hotel Argento, Golden Tulip Vivaldi and Marina Hotel Corinthia. The standard of hotels is good in Malta, however, I would recommend to stay in at least 4* accommodation to avoid disappointment. Each year Malta is increasing in popularity with the Irish as a holiday and wedding destination. It is very likely that you know of somebody that has holidayed or married there. Check out my Instagram account for inspiration for your destination wedding in Malta. If you need some support on determining what are the best options for your Destination Wedding in Malta, then I would love to hear from you. Planned By Tara is Ireland’s ONLY wedding planner specialising in Destination Weddings in Malta. I work with clients from around the world to create fun, bespoke and stylish weddings in Malta.